In the last couple of hours of their second day in space, the crew of Apollo 11 return their spacecraft to the Passive Thermal Control roll, they try to observe a laser fired at them through a telescope in Texas, then they settle down for the night. 034:41:42 Duke: Hello, Apollo 11, Houston. Over. 034:41:47 Aldrin: Go ahead, Houston. Apollo 11. 034:41:49 Duke: Roger, Buzz. The attitude that we're in right now is a convenient one to start PTC in. We'd be satisfied with this attitude. So we'd like you to disable quads Charlie and Delta; and we'll wait about 5 to 10 minutes, and then we'll establish the PTC. Over. 034:42:10 Aldrin: Roger. Disable Charlie and Delta, and we'll wait before starting PTC. This is Apollo Control at 34 hours, 46 minutes. Apollo 11 is presently 131,000 nautical miles [242,612 km] from Earth, traveling at a speed of about 4,300 feet per second [about 1,300 m/s]. 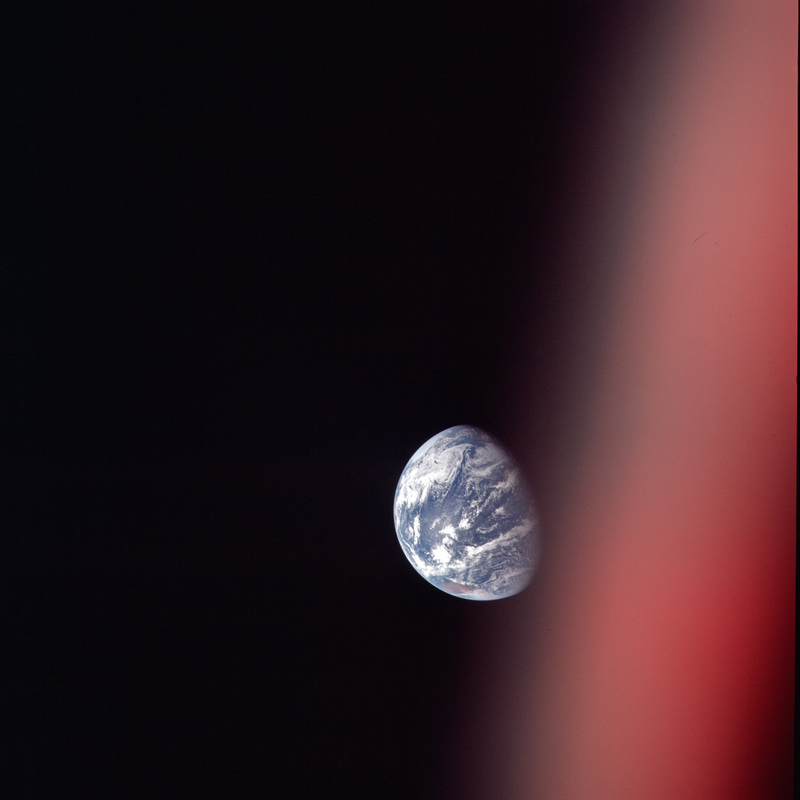 During the TV transmission, the crew advised that they may possibly be able to take the color television camera into the Lunar Module with them tomorrow at about 56 hours, 30 minutes Ground Elapsed Time. They reported that the cables had been checked and appear to be long enough to take them into the Lunar Module. During the next hour or so, the activity here in Mission Control will be revolving around getting the crew set up for their rest period and eat period. This will be a very long rest period tonight; scheduled 10 hours. That will begin, according to the Flight Plan, at about 37 hours Ground Elapsed Time. 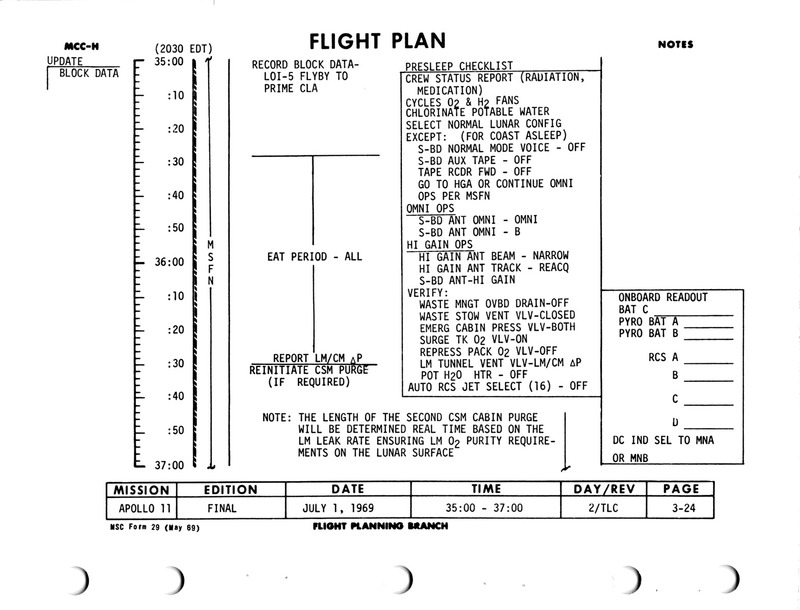 However, we would anticipate if activities move along as they appear to be at this point - we are somewhat ahead of the Flight Plan - that perhaps again tonight we would be able to get the crew into their rest period and sleep period a little bit early. At 34 hours, 48 minutes; this is Apollo Control, Houston. About now, it appears that another photo of Earth is taken, based on image measurement and triangulation. AS11-36-5374 - Earth at about 243,400 km or 131,400 nautical miles. North is at about 10 o'clock and the eastern Pacific Ocean dominates the daylit portion of Earth. The western coast of North America including the Baja peninsula is clear and is approaching the terminator. Image by LPI. 034:53:17 Duke: Hello, Apollo 11, Houston. The rates are damped out well enough for you to initiate the PTC now. Over. 034:53:26 Aldrin: Okay. We'll get it going. 034:59:58 Collins: Houston, Apollo 11. 035:00:03 Duke: Roger. Go ahead. 035:00:09 Collins: Roger. This time the DAP didn't like 0.3. It's - We followed the procedures; we got down to 70000 Enter. It took off at about 0.7. 035:00:21 Duke: Roger. We're copying that. Stand by. 035:00:39 Aldrin: Houston, Apollo 11. Would you like high gain back? 035:00:43 Duke: Roger. And you - Would you select Attitude Hold? Over. 035:01:09 Armstrong: Houston. Would you say again what your request is? 035:01:15 Duke: Roger, 11. We'd like you to go back to Attitude Hold. Over. 035:01:24 Duke: 11, Houston. Looks like we're going to have to reinitialate [sic] - reinitialize this PTC. 035:01:41 Collins: Okay. Do you have any roll angle that you'd like to stop it in, Charlie? I haven't stopped it yet. 035:01:55 Duke: 11, Houston. It's your preference right now if you want to. Over. 035:07:47 Duke: Apollo 11, Houston. Over. 035:07:52 Aldrin: Houston, Apollo 11. 035:07:53 Duke: Roger, 11. The problem on that initial starting up the PTC was we failed to do the Verb 49 which - and load the desired initial attitude; so the DAP tried to take it back to the old attitude that we had started up in [a] number of hours to go. That's why we picked up the rates in the other axes. We're going to wait in this attitude for about 20 minutes to damp out the rates again, and then we'll proceed with the Verb 49 and load our attitude that we have at the time - at this time. Over. 035:08:37 Collins: Okay. It sounds good, Charlie. When you get to the Verb 49, I'd like for you to give me the three gimbal angles that you want loaded. 035:08:44 Duke: Roger. We'll do. Over. 035:08:50 Duke: And Apollo 11, Houston. We have your fly-by PAD if you're ready to copy. Over. 035:09:31 Aldrin: Houston, Apollo 11. Is that P30 PAD? 035:09:34 Duke: That's affirmative. Over. 035:09:41 Aldrin: Okay. Ready to copy. 035:09:42 Duke: All right, Buzz. It's - fly-by is the purpose. SPS/G&N: 62815, plus 0.97, minus 0.20; 070:54:59.44; minus 0002.8, plus 0002.3, plus 0006.9; 029, 149, 312; apogee is NA, plus 0022.1; 0007.8, 0:01, 0003.4; sextant star, 01, 218.5, 22.7; boresight star is NA, NA, NA. Latitude is minus 02.65, minus 165.00; 1189.9, 36228, 144:56:47. In the comments: your set stars are Deneb and Vega, 007, 144, 068. No ullage. It's a docked burn using the PTC REFSMMAT. Stand by for your read-back. Over. 035:12:41 Aldrin: Okay. Would you give me GET of 0.05g again, please? 035:12:44 Duke: Roger. 144:56:47. Over. 035:12:58 Aldrin: Roger. Flyby SPS/G&N: 62815, plus 0.97, minus 0.20; 070:54:59.44; minus 0002.8, plus 0002.3, plus 0006.9; 269, 149, 312; NA, plus 0022.1; 0007.8, 0:01, 0003.4; 01, 218.5, 22.7; NA; minus 02.65, minus 165.00; 1189.9, 36228, 144:56:47; Deneb and Vega; 007, 144, 068. No ullage; docked, PTC REFSMMAT. Over. 035:14:12 Duke: Roger. Say again your roll angle, Buzz. I copy - I read 029. Over. 035:14:22 Duke: Roger. Good readback. Purpose: This PAD is for a small contingency burn in case the crew decide not to enter lunar orbit. Instead, the burn would set the spacecraft on a precise trajectory for return to Earth. Systems: The burn would be made using the large SPS (Service Propulsion System) engine at the rear of the Service Module, under the control of the Guidance and Navigation system. CSM Weight (Noun 47): 62,815 pounds (28,492 kg). Pitch and yaw trim (Noun 48): +0.97° and -0.20°. The SPS engine is mounted on gimbals and can be aimed so that its thrust vector (the direction in which it pushes) acts through the spacecraft's centre of mass. These angles represent a calculated direction for these gimbals. They will only be used if the crew need to control the burn manually using the Stabilization Control System (SCS). In a normal automatic burn, the TVC (Thrust Vector Control) system automatically adjusts these angles for shifts in the stack's centre of mass. Time of ignition (Noun 33): 70 hours, 54 minutes, 59.44 seconds. Change in velocity (Noun 81), fps (m/s): x, -2.8 (-0.85); y, +2.3 (+0.7); z, +6.9 (+2.1). The change in velocity is resolved into three components which are quoted relative to the LVLH (Local Vertical/Local Horizontal). Spacecraft attitude: Roll, 269°; Pitch, 149°; Yaw, 312°. The desired spacecraft attitude is measured relative to the alignment of the guidance platform. HA, expected apogee of resulting orbit (Noun 44): Not applicable. If this abort burn were to be made, the apogee of the resulting orbit would be over 9999.9 nautical miles, beyond the limit of the computer's display. HP, expected perigee of resulting orbit (Noun 44): 22.1 nautical miles (40.9 km). The perigee distance is so low, it intersects the Earth's atmosphere. What this really means is that the spacecraft will re-enter. Delta-VT: 7.8 fps (2.4 m/s). This is the total change in velocity the spacecraft would experience and is a vector sum of the three components given above. Burn duration or burn time: 1 second. Delta-VC: 3.4 fps (1 m/s). Using its ability to independently measure acceleration, the EMS can shut down the engine in case the G&N system fails to do so. This figure, Delta-VC, is slightly lower than Delta-VT because the EMS does not take account of the engine's tail-off thrust. Sextant star: Star 1 (Alpheratz, Alpha Andromedae) visible in sextant when shaft and trunnion angles are 218.5° and 22.7° respectively. This is part of an attitude check. Boresight star: Not available. This is a second attitude check which is made by sighting on another celestial object with the COAS (Crew Optical Alignment Sight). Expected splashdown point (Noun 61): 2.65° south, 165.0° west; in the mid-Pacific. Range to go at the 0.05 g event: 1,189.9 nautical miles. To set up their EMS (Entry Monitor System) before re-entry, the crew need to know the expected distance the CM would travel from the 0.05 g event to landing. This figure will be decremented by the EMS based on signals from its own accelerometer. Expected velocity at the 0.05 g event: 36,228 fps. This is another entry for the EMS. It is entered into the unit's Delta-V counter and will be decremented based on signals from its own accelerometer. Predicted GET of 0.05 g event: 144 hours, 56 minutes and 47 seconds GET. GDC Align stars: The stars to be used for GDC Align purposes are the north set, Deneb and Vega. The align angles are roll, 7°; pitch, 144°; yaw, 68°. The PAD includes some additional notes. The SPS propellant tanks are full, so there would be no need to perform an ullage burn to settle their contents. The burn details assume the LM is still docked and the attitude values are based on the guidance platform being aligned per the PTC REFSMMAT. This is Apollo Control at 35 hours, 13 minutes. Apollo 11 is presently about 93,265 nautical miles [172,727 km] from the Moon and with respect to the Moon is traveling at a speed of about 4,019 feet per second 1,225 m/s. At this time we are receiving the tape playback which Goldstone - the tracking site at Goldstone, California received from the spacecraft in that earlier unscheduled TV transmission. This was a test of the system using the spacecraft on the antennas, the small omnidirectional antennas. Normally transmissions from this distance in space would be - would require the High Gain Antenna. This television transmission is being processed and converted to color and we anticipate that we'll have it available for playback at about 9:00 pm. We are in conversation with the spacecraft at this time. We'll pick up the tape recorded conversation that we have and then stand by to follow any live conversation. 035:14:38 Collins: Houston, Apollo 11. On the seven-tenths rate, the rate loaded into the DAP is one or two tenths. 035:17:46 Duke: Hello, Apollo 11. Houston. Over. 035:17:51 Collins: Houston, Apollo 11. Go. 035:17:53 Duke: Roger, Mike. Would you please copy down your Verb 16 Noun 20 ICDU angles now, then execute a Verb 49 and load that - those angles, the Noun 20 that you see on the DSKY into the Verb - into the Noun 22 slot; and Pro on that, and that will start our 20-minute rate period. Over. Verb 16 Noun 20 will reveal the current gimbal angles from the IMU, essentially the spacecraft's attitude in hundredths of a degree with respect to the current REFSMMAT. Noun 22 is for new angles so it seems he is to copy the current angles into a slot for new angles. 035:18:18 Collins: Okay, Charlie. I'll do that right now, and just a matter of interest, those numbers are plus 04511, plus 09021, and plus 35984. Over. 035:20:13 Collins: Houston, Apollo 11. I've done that and, of course, I got an immediate 50 18, so I guess we're set up to proceed from here, and I'll start the 20-minute timer. Verb 50 Noun 18 means please perform an automanoeuvre. 035:20:44 Collins: Houston. I still question that seven-tenths rate with two-tenths loaded into the DAP, though. Could you explain that one? 035:20:50 Duke: Roger. We're working on it. Standby one. 035:25:42 Duke: Apollo 11, Houston. Over. 035:25:48 Collins: Houston, Apollo 11. 035:26:15 Collins: At this roll attitude, what should our High Gain angles be? Maybe that would help us locate you. We don't see you because of the LM. 035:27:27 Duke: Hello, Apollo 11. Houston. Those High Gain angles are pitch minus 70, yaw 90. We think the Earth is apparently pretty close to plus Z-axis. Over. 035:28:08 Duke: Roger, Apollo 11. We've got a laser that we're going to - It's a blue-green laser that we're going to flash on and off at a frequency of on for a second, off for a second. It's coming out of McDonald Observatory near El Paso, which is - should be right on the terminator - or right inside the terminator. We are going to activate that momentarily. Would you please take a look through the telescope and see if you can see it. Over. The McDonald Observatory is part of the University of Texas at Austin. It is located 260 kilometres southeast of El Paso. After Neil and Buzz place a retroreflector on the Moon, the McDonald Observatory will be used to use laser pulses to establish the Earth/Moon distance with exquisite accuracy. 035:28:42 Collins: Telescope or sextant? 035:28:45 Duke: Either one. Over. 035:28:49 Collins: Okay, I'll try it with the telescope; and if I don't see it there, then I'll try the sextant. The telescope is only a one-power device whereas the sextant will magnify 28 times. 035:28:53 Duke: Roger. We'll give you the word when they've got it turned on. Over. 035:29:44 Duke: 11, Houston. They don't have it turned on yet. We'll give you the word when they got it turned on. Over. 035:30:42 Duke: Hello, Apollo 11. Houston. We noticed the Cryo pressure dropped a moment ago. Did you stir up the Cryos? Over. 035:30:50 Aldrin: Roger. We've finished our cycling operations. 035:30:53 Duke: Rog. Copy. Out. 035:33:53 Duke: Hello, Apollo 11. Houston. McDonald's got the laser turned on. Would you take a look? Over. 035:37:07 Armstrong: Okay. Stand by. The shaft and trunnion angles are to allow the high-power sextant to be aimed directly at the laser's source. The one-power telescope, on the other hand is really a wide-field device. 035:38:55 Duke: Apollo 11, Houston. If you see it, it should be coming up - appear to be coming up, through the clouds. McDonald reports that there's a break in the clouds that they're beaming this thing through. Over. 035:39:54 Duke: Hello, Apollo 11. Houston. You can terminate the exercise on the laser. Our rates are steady enough now for to commence the PTC. Over. 035:40:06 Collins: Okay, Houston. Neither Neil nor Mike can see it. Incidentally, those shafts and trunnions just missed pointing at the world. 035:40:26 Collins: As we are looking at it through the scanning telescope, it would be about a - oh, maybe a third of an Earth radii high and to the left. 035:40:39 Collins: But, we did - but we did identify the El Paso area and it appeared to us to be a break in the clouds there, and we looked in that break and saw nothing. 035:40:48 Duke: Roger. Thank you much. Out. 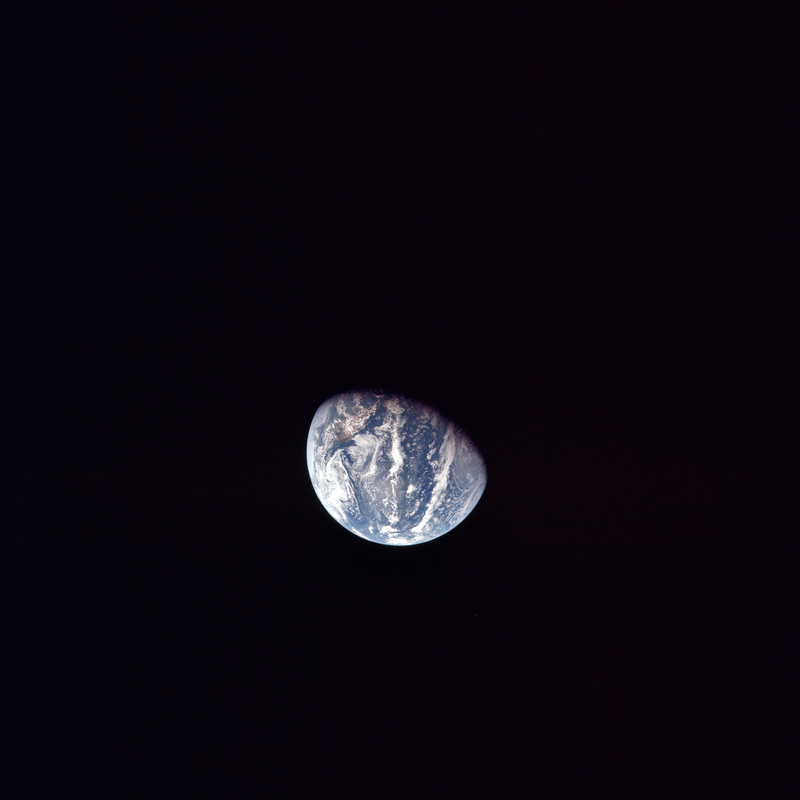 035:43:06 Collins: Houston, Apollo 11. Over. 035:43:09 Duke: Roger. Go ahead. Over. 035:43:13 Collins: Were you following that on the DSKY? 035:43:28 Duke: 11, Houston. What's your exact question? Over. 035:43:34 Collins: I've followed the procedure through step 7 down to the point where I've got 27303 Enter, and this resulted in an Operator Error light. 035:45:04 Duke: Apollo 11, Houston. Stand by a moment. We'll have an answer for you momentarily. Over. 035:45:11 Collins: Okay. Appreciate it, Charlie. Now the light's gone out without any further DSKY action. 035:45:18 Collins: Correction. Stand by, that's not so. 035:57:06 Duke: Hello, Apollo 11, Houston. 035:57:11 Aldrin: Houston, Apollo 11. 035:57:13 Duke: Roger. We've finally gotten concurrence on our problem here with 50 guys looking at it. When we were sitting in the 50 18, we attempted to load the erasable before you terminated the Verb 49. So, Mike, what we're going to have to do is call up the present CDUs, copy those down, and do a Verb 49, load the present, then do a Proceed, then an Enter, and then we can then set up Attitude Hold in step 6. Over. 035:58:03 Collins: Okay. I think that's what we did last time. 035:58:10 Duke: It appeared to us that we attempted to load the erasable prior to entering on the Verb 49 which Verb 49 was still running, and it clobbered the CDUs. Over. The computer has 2Kwords of erasable memory to which Mission Control can request access. 036:01:02 Collins: Houston, Apollo 11. We're moving at the proper rate. 036:01:51 Duke: 11, Houston. It looks great to us now. Over. 036:01:59 Collins: It looks fine here, Charlie. The seven-tenths part is the only part I don't find explained yet. 036:02:05 Duke: Roger, Mike. We're working on that one right now. We're coming up with a story soon. Over. 036:02:24 Duke: 11, Houston. We're handing over comm to Goldst - Correction, from Goldstone to Honeysuckle. Over. 036:02:53 Collins: Hello, Houston through Honeysuckle. Over. 036:03:00 Duke: Apollo 11, Houston. Go ahead. Over. 036:03:05 Collins: You sound good to us through Honeysuckle. How do we sound? This is Apollo Control. At the present time we are handing over from the tracking site at Goldstone, California, to the site at Honeysuckle, which accounts for the noise in the transmission. 036:04:02 Duke: Hello, Apollo 11. Houston. How do you read now? Over. 036:04:07 Aldrin: Roger. I'm reading you loud and clear. I'm not sure I got all those. I've got S-band Omni B, Omni, track to Manual, and beam wide, pitch - you'd better say that again, and yaw 270. Over. 036:05:24 Aldrin: Houston, Apollo 11. Are you ready to copy some numbers on status report, et cetera. 036:05:38 Aldrin: Roger. Are you ready to copy some numbers on the status report, et cetera? 036:05:49 Aldrin: Okay. Radiation: CDR, 11005; CMP, 10006; LMP, 09007. Medication negative. And I got some battery and RCS numbers for you. 036:06:07 Duke: Go ahead. Over. 036:06:10 Aldrin: Battery C, 37.1; Pyro battery A and B, both 37.1. RCS Alpha, 82; Bravo, 84; Cocoa, 85; Delta, 87. Over. 036:06:28 Duke: Roger, we copy. Radiation 11005, 10006, 09007; no medication; 37.1, 37.1, 37.1, 82, 84, 85, 87. Over. 036:06:51 Aldrin: That's affirmative. And you want a LM/CM Delta-P? It's 1.1 [psi]. 036:07:56 Duke: Hello, Apollo 11. Houston. Please verify that four Cryo heaters, Auto; the four fans, Off. Over. 036:08:07 Aldrin: Okay. We've been holding the O2 heater number 1 in the Off position. I believe that was your last instruction. All the other heaters are Auto and all fans are Off. Over. 036:08:22 Duke: Roger. Stand by. 036:08:26 Duke: 11, Houston. We'd like all heaters, Auto. Over. 036:09:00 Duke: Hello, Apollo 11. Houston. As the Sun sinks slowly in the west, the White Team bids you good night. If we get a story on the seven-tenths, we can give it to you in about 15 minutes or so; if not, we'll give it to you in the morning. Over. 036:09:15 Collins: Okay. That sounds fine, Charlie. Thanks very much. 036:09:32 Aldrin: Hey, you earned your pay today, Charlie. Thank you. 036:09:39 Duke: Rog. Good night all. This is Apollo Control at 36 hours, 11 minutes. At the present time, Apollo 11 is about 134,000 nautical miles [about 248,000 km] from Earth. The velocity is 4,216 feet per second [1,285 m/s]. During that last series of transmissions from the crew, we received a status report from Buzz Aldrin and he reported that the crew has, in the past 24 hours, taken no medication. This is similar to the crew status report that we received from them last night. We bid them good night at 36 hours, 9 minutes; or about 2 minutes ago. We anticipate that the crew will probably have a few more housekeeping-type chores aboard the spacecraft before they actually turn in and also we'll probably be combining their eat period with the first part of that sleep period. At 36 hours, 12 minutes into the flight of Apollo 11; this is Mission Control, Houston. 036:20:05 Duke: Hello, Apollo 11. Houston. One request: the optics switch to zero. And we've got a lot of theories on why it maneuvered at seven-tenths a moment ago, Mike, but no real definite answer. We'll be back with you later. Over. 036:20:21 Collins: Okay. No rush, Charlie. Thank you. This is Apollo Control at 36 hours, 27 minutes. We have completed the processing of the unscheduled television transmission which the crew sent down from the spacecraft at about 30 hours, 24 minutes Ground Elapsed Time this evening. I would like to repeat that this was an apparent test of the onboard system. The crew turned the television equipment on and left it on for about 52 minutes. Some of the time we will have a picture, other parts of it, we don't have good lock-on, and will not have a good solid picture. We should also point out that this transmission was made with the omnidirectional antennas, which, of course, don't provide nearly the signal strength that we would get from the High Gain Antenna, which would be used. We'll play back the tape of that transmission for you at this time. This is Apollo Control. The view that we have at the present time appears to be out the window of the Command Module looking at the Lunar Module docking target. The PAO announcer would appear to be referring to this video clip. And we seem to have a fairly good view here of the interior of the Command Module. This would look to be the panel, display panel with some of the fuel quantity dials on the right side of the cockpit. This my be the video clip that is being referred to. At the time these television pictures were transmitted from the spacecraft, Apollo 11 was about 121,000 nautical miles [about 224,000 km] from Earth. Where we do have good signal lock-on, we get amazingly good quality on those little omni antennas. As we had mentioned before, normally the High Gain Antenna would be used for television transmission of this sort. And we could almost make out a face in that one, and somebody's hand down at the instrument panel. That last view, just before we lost picture lock-up, appeared to be the right-center portion of the Main Display Console, main display panel in the Command Module. For a brief moment there we had a picture of a somewhat placid Neil Armstrong closing his eyes momentarily. Another crewman to his left, I'm not sure, at this point, that I can make out who it was. It did appear it might have been Mike Collins. This is Apollo Control. That concludes the replay of the test transmission from Apollo 11. That transmission occurred about 2 hours prior to the regularly scheduled TV transmission this evening. The crew apparently testing out the onboard system, and we received about 52 minutes of intermittant television using the spacecraft omnidirectional antennas. And as you could see, as particularly near the end, this is just - appears to be just about the limit of television reception from the omni antennas. At the time of the transmission, Apollo 11 was about 121,000 nautical miles [about 224,000 km] from Earth. During the replay of that television transmission, we accumulated a very short amount of tape, one or two brief comments from the crew, who are in their sleep period at this time. We'll play back that tape conversation for you now. Based on image measurement and triangulation, it appears that about now, another photo of Earth is taken, AS11-36-5375. AS11-36-5375 - Earth at about 252,000 km or 136,000 nautical miles. North is at about 2 o'clock and the Pacific Ocean dominates the daylit portion of Earth. Australia has appeared on the left and the western coast of North America is about to reach the terminator. Image by LPI. 036:52:06 Duke: Hello, Apollo 11. Houston. Over. 036:52:10 Collins: Houston, Apollo 11. 036:52:12 Duke: Roger. Mike, I think we can explain that seven-tenths rate. When we - the first time through, you know, we failed to go through the Verb 49, so we had a large error between our actual CDU and desired CDU in roll. And with that situation, the DAP - the vehicle will roll - will maneuver, rather, at a rate that is loaded in, which was three-tenths plus four-tenths rate, and it will limit at four-tenths above the desired rate, so - that is if we have a large enough angle between the desired and the actual, which we did. So, therefore, the rate was four-tenths plus three-tenths to give you the seven-tenths. Over. 036:53:08 Collins: Okay. Thank you. At this time, Apollo 11 is 137,219 nautical miles [254,130 km] from Earth. The spacecraft is traveling at a speed of 4,132 feet per second [1,259 m/s]. Here in Mission Control, things have settled down into a rather quiet nightime routine. We said good night to the crew at about 36 hours; 36 hours, 9 minutes to be exact, a little over a hour ago. We did hear from them once or twice since then and we anticipate that at this time they are probably getting settled down to begin their 10-hour sleep period. At 37 hours, 21 minutes; this is Apollo Control. This concludes the second day of the flight of Apollo 11. The crew will now be out of radio contact with Mission Control for more than 11 hours.